This week's thesis journey was straight research. Alan's comment on last week's blog got me to thinking. Alan's mention of Kurt Vonnegut reminded me of this book that I've had sitting on my shelf for the longest. Now, I never actually read it. It was recommended by Dr. Mary Ann Riley at a professional development workshop. (I love her by the way. Any PD she's teaching I want to be there front and center!) At this workshop she was teaching teachers how to teach students to be better readers and writers and at some point she mentioned this book. And I immediately went on Amazon and ordered it. Anyway, I cracked open this book, started flipping around until I found a section that I felt was a great starting point for the things I needed to focus on in my writing. I landed on Chapter Eight titled Details. 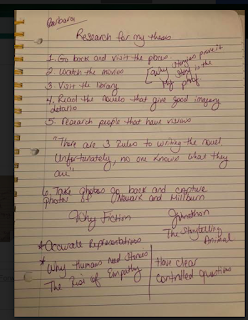 During our Google Hangout chat with Barbara, we talked about writing techniques and tips. In order to be a good writer, one who has honed and perfected their craft you have to study great writing. 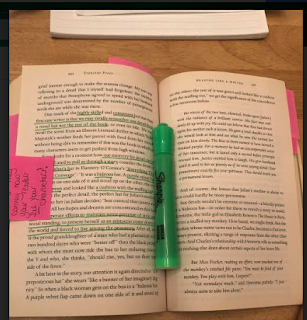 So, before I select and read my mentor texts with the lens of learning the craft. 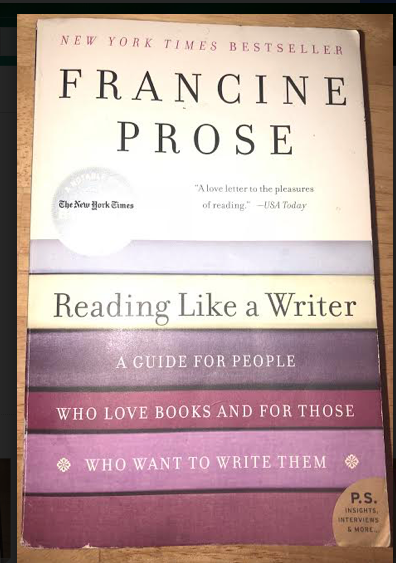 I decided to see what Francine Prose had to say about good writing. I was one page into the chapter when cracked open my highlight. Prose says a friend told her, "...God is really in the details." This stopped me in my tracks. I started thinking about photos. What makes a good photo. It is the details the parts of the image that the camera has captured and allows us to stare upon it with adoration. And some of the best images, with the best lighting isn't usually created by man. It is the natural light, created by God that hits just right creating the perfect...detail. One of my favorite quotes about reading was said by Mason Cooley, "Reading gives us somewhere to go when we have to stay where we are." I truly believe that this is done through the details and the images that the author so skillfully creates in our minds. When I go back and revise my manuscript I have to remember and look for moments when I do this. The lack of considering the importance of these details could have a huge impact on my story as a whole. Considering the big picture of what I plan to achieve or accomplish with my manuscript that notion is everything to me. I have consider my audience for my novel and what I want Misunderstood to impart on them what message am I sending them, what Easter eggs am I leaving behind in my details. This chapter opened my eyes to what I need to do as a writer. It was very educational to put on that hat and look at literary moves as a author and not just as an analytical reader of literature. I am going to look for more texts to read on the craft of writing. 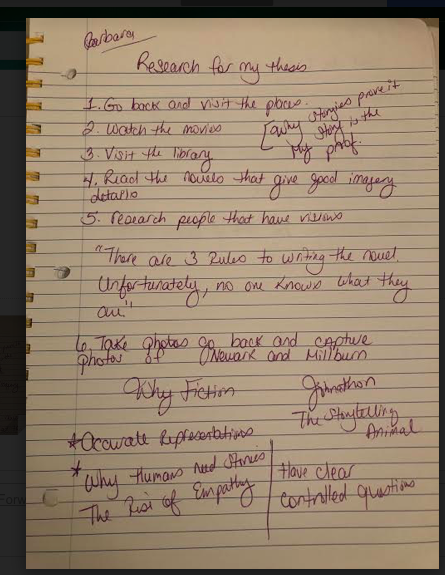 I think it is important to start my research journey here because this will make it easier when I move into writing the my research piece where I take a deeper dive into my questions. Why do humans need stories? 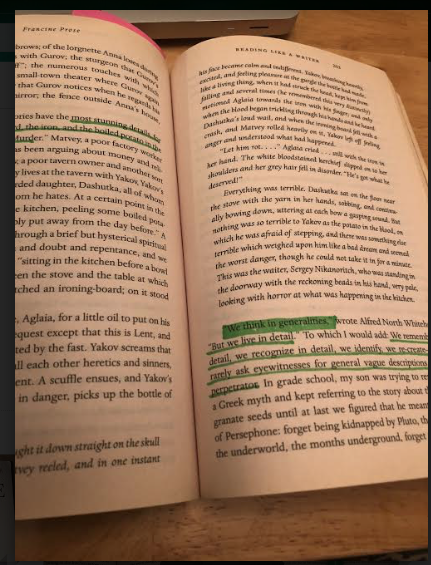 How does my work fit amount the books that inspire me? Should it? I was begin to consider one of my questions, why fiction. This video on the Future of Storytelling was very insightful and it provided some science data as to how storytelling affects our brain. So yes, God is in the details and my job as a writer, is to figure out how to make each detail count. These books are my inspiration. Now, I have to admit that I haven't read all of them. In fact, I've only read two of them and yet, I have all of them in my collection. Sitting on top of my bookshelf staring at me, patiently waiting to be cracked open and read. The reason I haven't read these books is well, totally work related. Yea, I blame it all on my job. It sounds really lame, but it is true. I want nothing more than to read and occasionally binge watch This is Us. But well, the way my life and responsibilities are set up... that is just not in the cards. Anyway, I'm getting ahead of myself. Like I said, these books are my inspiration. Last week we had the pleasure to video chat with Barbara Ganley @bgblogging. Alan was there too, but Barbara's feedback and input was amazing. I couldn't write down my notes fast enough. She said so many "quotable" things that I just couldn't keep up. "There are three rules to writing the novel, unfortunately, no one knows what they are." I kept reading this over and over again. The rules of writing, what I think or know them to be really don't matter. The writing is what matters. The words that you put on a blank screen matter. It doesn't even matter if everything that you write is crap as long as you're writing. Every single thing Barbara said resonated with me. I felt like she was speaking only to me. Everything she was saying I needed to hear. Even though I didn't want her to stop talking, there was a part of me that wanted to end the call and jump right into writing. I didn't of course. Not that day but next day I did steal some moment to write. The conversation was just as good. I walked away from the conversation realizing that I had some reading to do. Reading not only for pleasure but for research too. Which brings me back to those books. They are truly are inspiration. Those books are written by some of the best authors in the game right now. I use their books to teach my students about good writing and good storytelling. But this time when I'm reading, I have to look at them from a different perspective. More than just being good books. 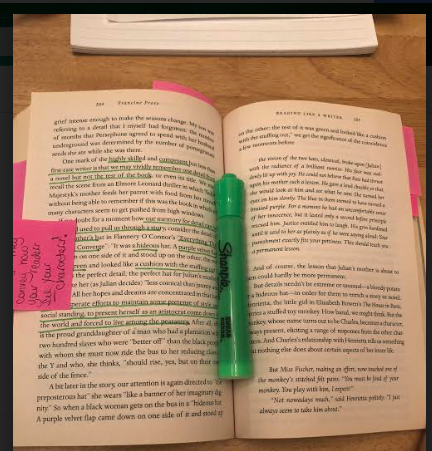 I need to go back with a pen and mark up the text looking for moments when the author is showing and not telling. How does the author create imagery to bring the reader into the story? I need to pay attention to these writing nuances to help me in my own writing while simultaneously thinking about my thesis project. How does my work fit amoung the books that inspire me? Should it? Before I read a single page from any of those books, This week, I chose to start my research by watching a book. I watched this TedTalk by Grace Lin a while back and I thought it was a good place to start my research. This time I watched it with this question in mind, why fiction? Why fiction with characters that represent myself and the children that I teach? Last year in one of Dr. Zamora's class fellow grad student Richonda told me about a book called The Hate U Give by Angie Thomas and it changed my life. Now, I've always been an avid reader. And since I've become a middle school teacher I've become addicted to YA (young adult) novels. They are my new favorite obsession. 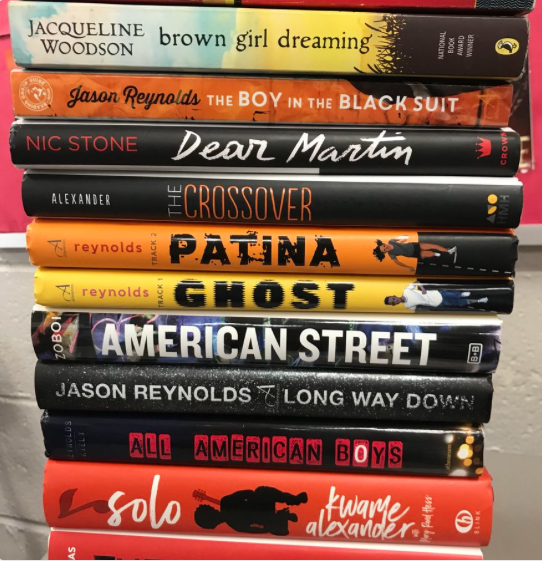 Every single time I get my hands on my a book that I know will make my students want to read I cannot wait to get it into the hands of students. 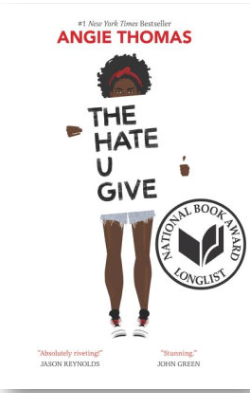 The Hate U Give aka THUG is that book. 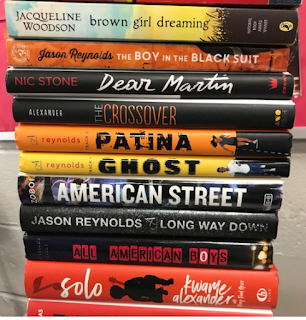 Since I have found books like Dear Martin, The Miseducation of Margot Sanchez and I'm Not Your Perfect Mexican Daughter -- each of these titles I have purchased and given to my students. The largest purchase came from Donors Choose. And I am telling you. I cannot keep these books in my library longer than a day. After I finished reading this book I wanted more. I wanted to read more like it. In my quest I realized that I wanted to write one like it. I had a THUG type story inside of me. I always have. I dabbled in writing before. But none of my stories kept me away or motivated me like the story I am working on for my grad thesis titled, Misunderstood. Growing up in Newark, NJ and now teaching there has inspired me to want to share their stories with the world. 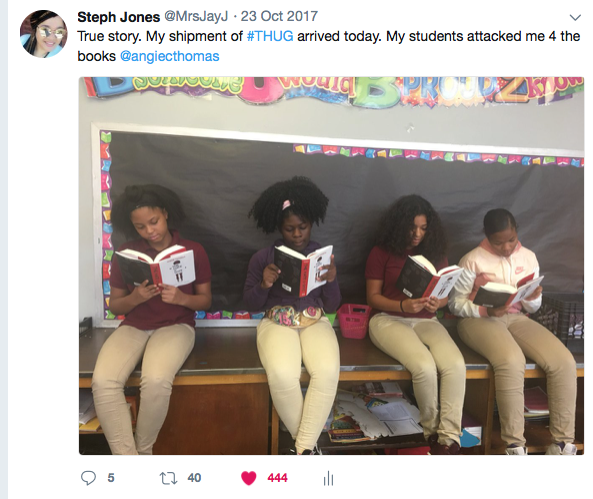 My students deserve to read books where they see themselves represented. More importantly, I am writing the books that I wished I had as a child. In my writing of this novel I know that I have a lot of research to do. The first is figuring out the lane that my book needs to be in. Why does it matter? What space will it occupy in the world? Interestingly enough my research started with Twitter and the hashtag #weneeddiversebooks. I took this as my call to action as an author. I have stories to tell. Fifteen-year old MYA ANDREWS’ life has never been easy. When her grandmother, BIG MA dies the summer before her junior year, it is yet another disadvantage added to her life. Not your average girl from the hood, Mya is no slouch in school. In fact, she prides herself on being a straight A student. She’s determined to succeed in spite of having suffered so much loss. Each loss drives Mya’s dream of going to college to become a doctor-- fulfilling a promise she’d made to Big Ma. Big Ma’s death leaves Mya with two very heavy burdens to bear; Big Ma’s gift of sight and KEVIN the father she’d never met showing up to take her away. Kevin rips her away her from the only family and friends she’s ever known in Newark, NJ to live in Millburn--an upper middle class Jersey suburb. Mya is forced to forge a bond with her father, his wife and their kids. Mya’s visions are unpredictable at first. They give her insight into the past and glimpses of the future. But she doesn’t foresee the unexpected course that lies ahead. The first casualty of Mya’s move is her relationships with her best friend TAMIKA. While attending a cookout in her old neighborhood, a possible gang related shooting pops off. Tamika’s brother is killed and Tamika is injured. Word gets out that Mya’s father is leading the investigation. Mya’s friends including Tamika turn on her. Mya is branded a snitch all over social media and ostracized by everyone. Adding insult to injury, Mya has to learn to navigate her way through a new school where she’s clearly an outsider. Junior class president, self-proclaimed genius and overall jerk AUSTIN LUCKETT ensures that she doesn’t earn a spot on the school’s Academic Olympic team. Eventually, Mya learns to trust the one person she distrusts the most-- her dad. Austin’s loses his spot as captain of the Academic Olympic team. Mya steps into his spot proving all of her Millburn High haters wrong. In the end, Mya realizes that moving doesn’t destroy her identity-- it adds another layer to who she’s always been.